Could Mindfulness During Childbirth Bring Down Your PPD Risk? A new study has identified a surprising factor that could both make your labor more pleasant and bring down your risk of postpartum depression. If you're pregnant, chances are you're more than a little bit anxious about childbirth. But according to a new study, a simple practice could make both your experience in the delivery room and your early days as a mother more pleasant. According to researchers from the University of Wisconsin-Madison and the University of California, San Francisco, mindfulness training to address concerns about childbirth may have a significant influence that lasts even after you've delivered. 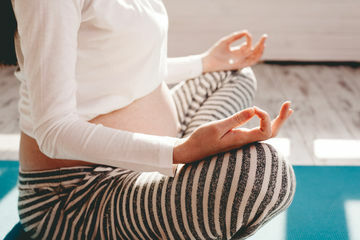 The study was published in BMC Pregnancy and Childbirth, and researchers performed a randomized controlled trial to compare the outcomes associated with traditional childbirth education and those in which pregnant women were also taught mindfulness. The researchers observed medical data from all the participants, and they discovered the women who were taught mindfulness had fewer depression symptoms. They also found mothers who were taught mindfulness reported lower levels of pain during labor. This isn't the first time we've heard of a possible link between the pain of childbirth and postpartum depression. As we've previously reported, past research has suggested that lingering pain after childbirth may increase a woman's chances of experiencing postpartum depression. "Fear of the unknown affects us all, and perhaps none more so than pregnant women," said the study's lead author, Larissa Duncan, according to a University of Wisconsin-Madison news release. "With mindfulness skills, women in our study reported feeling better able to cope with childbirth and they experienced improved mental well-being critical for healthy mother-infant adjustment in the first year of life." According to the researchers, some women report greater fear of childbirth after taking classes to educate them on the process. Mindfulness training works to address the fear of childbirth, and the effect may be great enough that mothers feel comfortable forgoing pain medication during birth. Leslie Fehan, a certified midwife at the Virginia Commonwealth University's Department of Obstetrics and Gynecology sees the value in this sort of training. "In my professional opinion anything that helps women give energy to positive thoughts and decrease negative thoughts is going to improve mood. I think pregnancy can be a time of fear for some women and having techniques to minimize that fear is incredibly valuable. Decreasing fear will also impact labor and birth [and] having a positive birth experience will also add to improve perinatal mood," Fehan told Fit Pregnancy. "This particular study specifically addressed women's fears. It is incredibly powerful for women's emotions to be validated and then for them to be given tools to cope and move forward in a positive way... This small study gives credence to the importance of recognizing fear, not adding to women's fears, and providing them tools to cope. I think it is still important to provide women support in the postpartum period to minimize mood disorders." Interested in practicing mindfulness during your pregnancy? We suggest utilizing these tips for managing your mood, checking out a prenatal yoga or meditation class, and giving these simple techniques a try. And, of course, you can ask your doctor to point you towards childbirth classes that focus on teaching mindfulness.